Prolific Moment: Theory and Practice of Mindfulness for Writing foregrounds the present in all activities of composing, offering a new perspective on the rhetorical situation and the writing process. A focus on the present casts light on standard writing components—audience, invention, and revision—while bringing forth often overlooked nuances of the writing experience—intrapersonal rhetoric, the preverbal, and preconception. This pedagogy of mindful writing can alleviate the suffering of writing blocks that comes from mindless, future-oriented rhetorics. Much is lost with a misplaced present moment because students forfeit rewarding writing experiences for stress, frustration, boredom, fear, and shortchanged invention. Writing becomes a very different experience if students think of it more consistently as part of a discrete now. 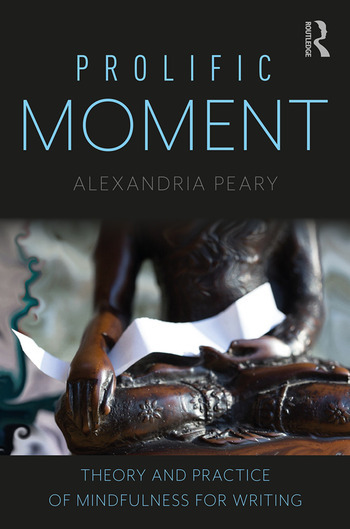 Peary examines mindfulness as a metacognitive practice and turns to foundational Buddhist concepts of no-self, emptiness, impermanence, and detachment for methods for observing the moment in the writing classroom. This volume is a fantastic resource for future and current instructors and scholars of composition, rhetoric, and writing studies. Alexandria Peary coordinates the first-year writing program and is a professor in the English department at Salem State University where she teaches courses in creative writing and composition. Peary’s blog Your Ability to Write is Always Present (alexandriapeary.blogspot.com) focuses on mindful writing and has an international following. She has given talks on mindful writing at institutions around the United States and in the U.K.